"You don't have to completely give up on enjoying drinks with friends while working on losing weight," Elora Bazanele, RD, LD, dietitian and founder of Love Food B Fit told POPSUGAR. "However, keep in mind that drinking alcohol contributes to our total daily calorie intake while providing minimal nutrients such as protein, vitamins, minerals, and fiber that our bodies need to stay healthy." And while the calories in each drink are important, it's also important to monitor how much you are drinking in any given week. 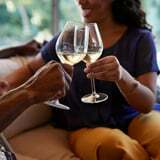 "Having a glass of wine a few times a week shouldn't be a problem, but if you have two or three glasses each night, those calories can make a big difference in your weight loss efforts," sports dietitian Cindy Dallow, PhD, RD, told POPSUGAR. Navigating the drinks list at your local bar can be like a minefield of added sugars and empty carbs. While there is no inherently "bad" beverage and you should enjoy everything in moderation, if you're trying to lose weight, you may want to be mindful of how many calories are in each drink.